Chapter "U" Meeting/Gathering is held on the 3rd Wednesday of each month at Chuy's at 14855 I-35 North, San Antonio, TX 78145 (Map). Meet to eat at 6:00 PM with information sharing beginning at 7:00 PM. On I-35 across from the Forum shopping center. Hope to see "U" there! Chapter "H" Meeting/Gathering is held on the 1st Thursday of each month at the Aspen Creek Grill, 11719 Bandera Rd, San Antonio, TX. Meet to eat at 6:30 PM with the meeting starting at 7:00 PM. Chapter "K2" Meeting/Gathering is held on the 3rd Tuesday of each month at the Pizza Hut, 945 US Hwy 90, Castroville, TX. Meetings start at 7:00 PM. Saturday April 27, 2019 - Progressive Party and Poker Run. Party starts at 11:00 AM at Sal Pesta's house 6707 Fairlake Dr., San Antonio. Must go to all 3 three locations for poker run. Sign-up at April 17th gathering if you are going to attend and bring chips, salad, or dessert. Saturday May 4, 2019 - Kent Powersports Annual Block Party - 3:00 PM to 7:00 PM. Chapter U will be cooking hotdogs or sausage wraps. Saturday May 11, 2019 - Painted Churches Ride. Depart from Kent Powersports at 9:00 AM. 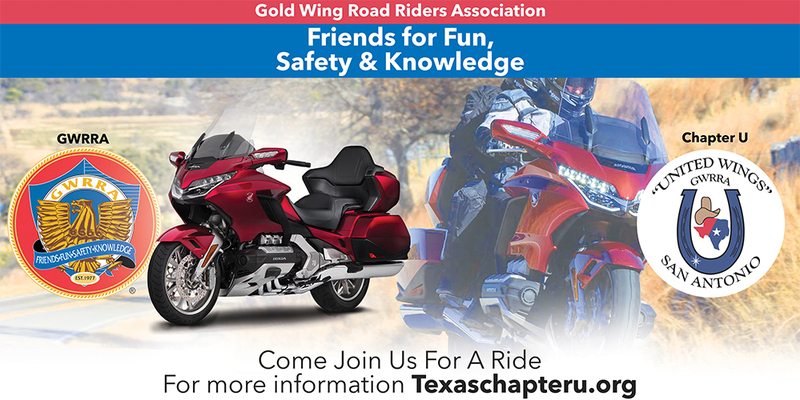 Saturday May 11, 2019 - Co-rider seminar at Kent Powersports at 10:00 AM. Wednesday May 15, 2019 - “Chapter Meeting/Gathering” will be at the Chuy's at 14855 I-35 North, San Antonio, TX 78145 (Map). Meet to eat at 6:00 PM with information sharing beginning at 7:00 PM. On I-35 across from the Forum shopping center. 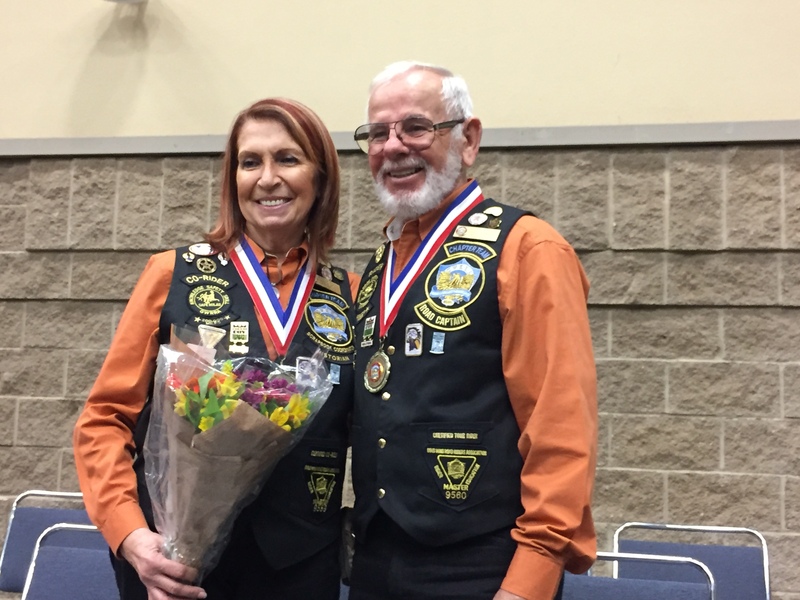 Saturday May 18, 2019 - Fredericksburg Vintage Motorcycle Show and Ride. Depart from Kent Powersports at 10:00 AM. Saturday June 1, 2019 - Breakfast Ride to Vanderpool and Lone Star Motorcycle Museum. Depart from Kent Powersports at 7:30 AM. Saturday June 15, 2019 - Breakfast Ride to The Den, La Vernia, TX. Depart from Kent Powersports at 8:000 AM. Wednesday June 19, 2019 - “Chapter Meeting/Gathering” will be at the Chuy's at 14855 I-35 North, San Antonio, TX 78145 (Map). Meet to eat at 6:00 PM with information sharing beginning at 7:00 PM. On I-35 across from the Forum shopping center. Saturday June 22, 2019 - Seguin Power Plant Dinner Ride. Depart from Kent Powersports at 4:30 PM or meet at restaurant at 5:30 PM. 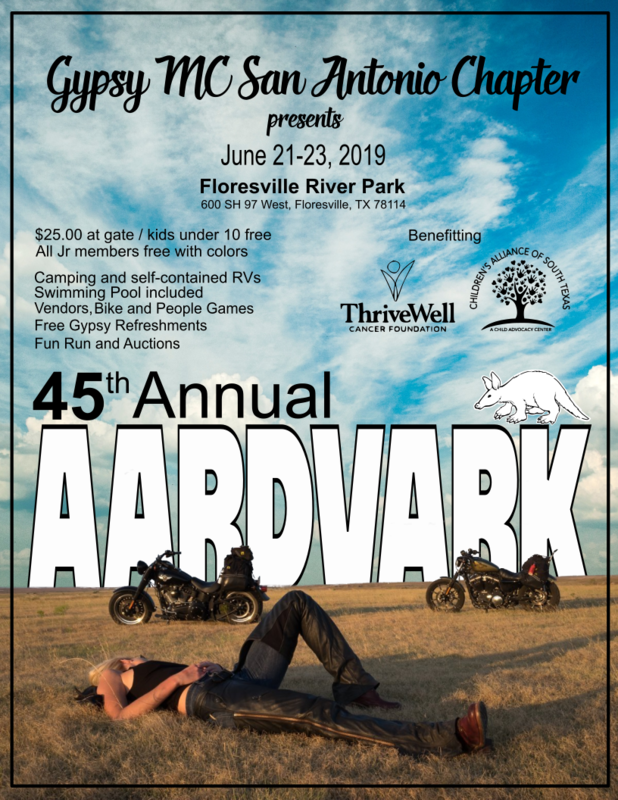 June 21 - 23, 2019 - 45th Annual AArdvark Rally - Floresville River Park, Floresville, TX. September 21, 2019 - Fredericksburg Classic Car and Truck Show, Pecan Grove Store, Fredericksburg, TX. 12:00 PM to 9:00 PM. Admission 3 cans of food or cash donation for the local food bank.